The property arm of Hong Leong Group is building a five-star hotel in Damansara Heights, sprawling over 3.45ha, with 250 rooms at an investment cost of some RM800,000 per room. GUOCOLAND (Malaysia) Bhd, the property arm of conglomerate Hong Leong Group, is ready to enter the Kuala Lumpur hotel scene by building a RM200 million five-star hotel in Damansara Heights. To be ready in 2011 or 2012, the hotel will form part of the Damansara City integrated development comprising retail, luxury condominiums and office towers. Managing director Paul Poh said that the hotel, located next to the Menara Millenium, is likely to carry the group's own hotel brand called Thistle. Thistle is part of Guoman Hotel Management (UK) Ltd, a unit of GuocoLeisure Ltd. Both companies are part of the Hong Leong Group. The proposed hotel, sprawling 3.45ha, will have 250 rooms, with an investment cost of some RM800,000 per room. Poh was speaking to reporters to introduce the UK hotel brand's maiden foray outside of its homeland. There are 34 Thistle hotels in the UK. Meanwhile, Guocoland is in the midst of renovating two of its existing hotels in the country for RM50 million to be rebranded as a five-star Thistle. Sixty per cent of the budget will go towards upgrading the Hyatt Regency Johor Baru, and the balance on Guoman Port Dickson. Upon completion, both will be renamed as Thistle Johor Baru and Thistle Port Dickson Resort, respectively. The two hotels will be closed for six months and will reopen in mid-2009. Poh, who expects the return on investment from the two hotels to take between four and five years, said the hotels' contribution to the group's revenue will improve after the upgrade and rebranding. Both hotels, with an estimated net book value of RM270 million, are expected to contribute about 37-40 per cent towards the group's revenue and net profit. Previously, contributions from both hotels were close to 30 per cent. For the year ended June 30 2008, Guocoland made RM41.24 million in net profit on revenue of RM120.13 million. Thistle Johor Baru general manager Philip Skitch said that in the first year of operations, the hotel hopes to fill up 70 per cent of its 381 rooms, and garner an average room rate (ARR) of between RM200 and RM250 per night. Thistle Port Dickson hotel general manager Dean Rossilli, meanwhile, hopes the 251-bedroom hotel will be able to more than double the occupancy to 65 per cent and is looking forward to achieving an ARR of between RM185 and RM225 per night in the first year. KUALA LUMPUR: GuocoLand (M) Bhd, the operator of UK-based Thistle hotels, aims to expand the hotel chain in Malaysia and Asia following a RM50mil refurbishment and rebranding exercise to be completed by the middle of this year for two of its Malaysian hotels, said managing director Paul Poh. He said the company would be opening more Thistle brand hotels in Asia, either though acquisitions or building new ones. “Yes, we are keen to expand the (Thistle) hotel business in Asia and Malaysia. Our intention is to be able to grow like we did in London,” he told reporters at the launch of the Thistle hotel brand in Asia yesteday. Two Thistle hotels are slated to open in Shanghai and Beijing, China by the end of this year, Poh said. In addition, GuocoLand is building another five-star hotel in its Damansara City project, an 8.5-acre integrated commercial development in Damansara Heights. The estimated RM200mil hotel, to be operated under the Thistle brand, is expected to complete by 2011 or 2012. 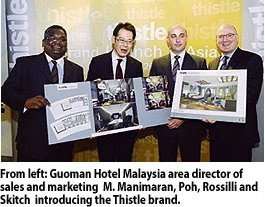 Thistle hotels are part of Guoman Hotel Management (UK) Ltd, owned by GuocoLand, a subsidiary of Hong Leong Group. There are 34 Thistle Hotels in Britain, which are predominantly four-star rated, including 11 in central London. The two five-star rated GuocoLand hotels undergoing the RM50mil refurbishment and rebranding exercise were the previously named Guoman PD and Hyatt Johor Bahru. They are now rebranded as Thistle Port Dickson Resort and Thistle Johor Bahru, the first time the Thistle brand was used outside of Britain. The occupancy rate of Thistle Johor Bahru is expected to rise to 70% from 50% previously, while Thistle Port Dickson Resort is projected to see the occupancy rate double to 65% in their first year of operations under the Thistle brand, Poh said. He added that he expected to see returns for the RM50mil investment in four to five years. With the new rebranded hotels, contribution from the hospitality segment is expected to rise to 37% of company revenue. Peviously, GuocoLand’s hospitality segment contributed about 30% of revenue to GuocoLand, while the remaining came from property development. Thistle Port Dickson Resort will have 251 bedrooms, a nine-hole golf course, nine function rooms and three kilometres of beach shoreline. The price of an average room ranges from RM180 to RM225 per night. Thistle Johor Bahru will offer 381 bedrooms including 125 luxury rooms, and 19 apartment units. The indicative room rates is between RM230 and RM250 per night. SP Setia Bhd, Malaysia’s biggest property developer, may acquire three real-estate companies from a state asset manager, increasing sales and gaining financial backing from the government, said RHB Research Institute Sdn Bhd. SP Setia would benefit if Permodalan Nasional Bhd sells three property units it is already planning to merge to SP Setia, in which Permodalan already owns shares, said RHB Research, the brokerage unit of RHB Capital Bhd, Malaysia’s fourth-biggest bank. Adding Island & Peninsular Bhd, Pelangi Bhd and Petaling Garden Bhd would enhance SP Setia’s value and provide it with strong financial backing from the state for expansion, RHB said. Malaysian developers’ sales slumped last year as the country’s exports fell, slowing economic growth, and the global financial crisis dried up credit. Permodalan’s three property units have combined annual sales exceeding RM1.31 billion (US$358 million), similar to SP Setia’s 2008 figures, the Business Times reported on March 18. SP Setia “could be pulled in to spearhead the merger in view of its strong brand name and market leader position in the local property industry,” RHB said in a report today and maintained an “underperform” rating on the stock. Permodalan chief executive officer Hamad Kama Piah Che Othman plans to complete the merger of Island & Peninsular, Pelangi and Petaling Garden in July, a newspaper reported March 28, citing the CEO. Hamad Kama Piah wasn’t available to comment when Bloomberg contacted Permodalan today. SP Setia CEO Liew Kee Sin and company spokesman Diana Chin weren’t immediately available to comment when Bloomberg called the company. SP Setia fell 0.6 per cent to RM3.28 at the 12:30 pm break on the Malaysian stock exchange, valuing the developer at RM3.33 billion. The benchmark Kuala Lumpur Stock Exchange Composite stock index advanced 0.4 per cent to 964.90. Permodalan held a 6.5 per cent stake in SP Setia as of January 30, according to data compiled by Bloomberg. A TOTAL of 102 Malaysian contractors have penetrated the construction market in 45 countries, undertaking various scope of work, Deputy Works Minister Datuk Yong Khoon Seng said today. He said they have completed 432 projects worth RM29.3 billion while 125 projects, costing RM69 billion, are under construction. "Their performance is to be proud of. It showed Malaysia's construction industry is capable of competing in the global market, providing services and work quality on par with foreign parties. The construction market in foreign countries covers work to build infrastructures, buildings and airports, he said. "This is the result of the capabilities developed in the domestic market over the past one decade," he said when opening the Southern Region (Negeri Sembilan, Johor and Malacca) Construction Week 2009 hosted by the Construction Industry Development Board at the Malacca International Trade Centre. CIDB chairman Tan Sri Jamilus Hussein was present.